It is still difficult to find the words to talk about Wycombe's 4-3 loss at White Hart Lane. Really proud that our fan owned team were so close to causing an upset. The atmosphere was great amongst the Wycombe fans who were determined to enjoy the occasion. The Tottenham fans even applauded us at the end which was a nice moment. The match will live long in my memory.... but then so will the pies. My brief research indicated the pies would be mass produced and probably not all that good. However, entering the concourse of the imaginatively named Upper South Stand, I got a sense that the pies might actually be a bit special. Pies seemed to be the main attraction at the food kiosks with an attractive 'N17 Pie Club' branding which was even printed on the pies themselves. They looked a bit more gourmet than pies at your typical football ground and had a slightly handcrafted appearance. These were certainly not Pukka pies... They also looked a bit bigger than average. My Dad and I both opted for the classic Steak & Ale which was useful as it allowed me to get a second opinion on what turned out to be a very good pie. What I had missed in my research was the big summer signing at Tottenham, the gourmet pie company known as Piglet's Pantry! 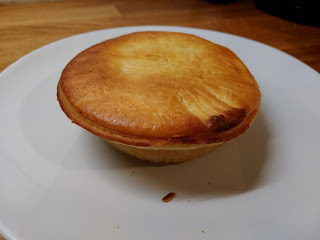 I knew these boutique pies from the South Coast started at Brighton and could also be bought at MK Dons because Pierateer Rob had previously reviewed them very highly (putting them 3rd in our Football Pie League). But I hadn't realised that Piglet's Pantry had started to supply a burgeoning number of football grounds including Reading, Swansea, Leicester and most excitingly, Tottenham. This was disguised by the fact that Piglet's Pantry didn't use their logo at all at Tottenham, so I only realised later. The Piglet's Pantry pie was nearly perfect for a football match. The thick pastry held it together nicely so that it could actually be picked up and eaten by hand. It had been cooked really well compared to a lot of football pies. The pastry was satisfyingly solid. Often football pies can have soft pastry, either because they are not cooked for long enough, or the dreaded convection microwave shortcut is used. If anything the pastry was a little too thick and almost a bit chewy. But the addition of herbs to the pastry crust made it taste great so this didn't really bother me. I could have eaten the pastry by itself which is always a good sign. The pie was well filled with plenty of meat and a thick gravy. The thick gravy was very much appreciated as it prevented the pie from becoming too much of a mess. The filling was a delight due to a great balance of flavours from both the meat and the ale. The ale gave a pleasant, hoppy and sour taste without being over powering. The flavour wasn't wildly different to that you would expect from a mass produced steak & ale pie but it did enough to stand out. The meat in the pie could have been a bit softer, it was bordering on overly chewy (although it was nice to have something to get my teeth into). There were also some soggy fat pieces which I didn't enjoy so much. 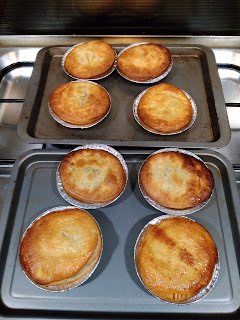 But overall the pie was very satisfying, it felt like I had got more for my money that I normally do with a football pie and I am delighted to see these good quality pies becoming more common at football grounds. What impresses me with Piglet's Pantry is that they are still maintaining high standards despite increasing production, which must be a challenge. They are also keeping things interesting by providing bespoke pies to different football clubs which prevents the boring homogenisation experienced by the growth of companies like Pukka. However, it is worth noting that I had forked out a #PieHighPrice of £4 for this pie which has affected the score. Yes, it was a premium product but these premium pies can be purchased for less at other grounds and £4 is a lot for one pie. Having said that, I would rather pay £4 for this pie than £3.50 for a dehydrated Pukka pie! Good luck to Piglet's Pantry as they continue to raise standards! It was great to be able to go to a game at White Hart Lane before Tottenham move out at the end of this season for it to be rebuilt. One corner of the ground had already been knocked down and work on part of the new stadium is already well underway. I hope Tottenham continue to use Piglet's Pantry in the new White Hart Lane although I am not sure if they will have much control while they temporarily relocate to Wembley. 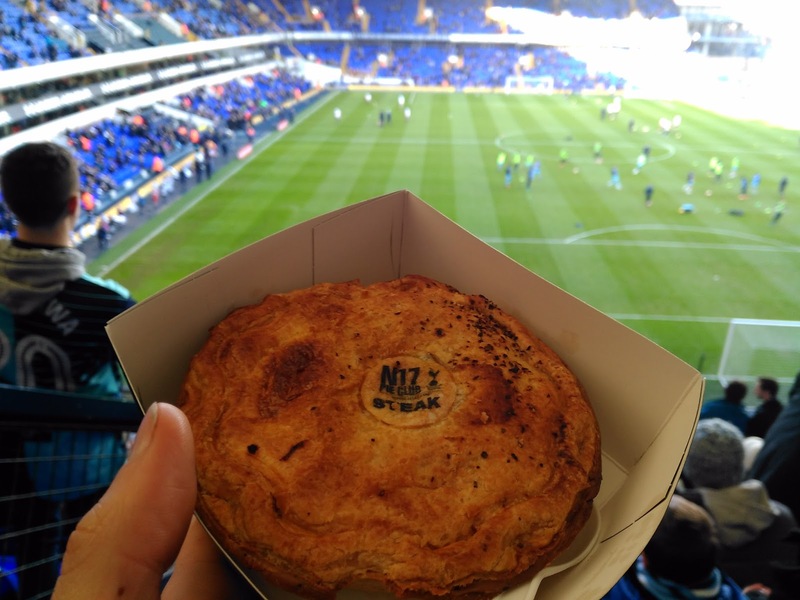 As pie standards at football grounds continue to improve, it is an exciting time for us. We will continue to tour different grounds and let you know where the best can be found! 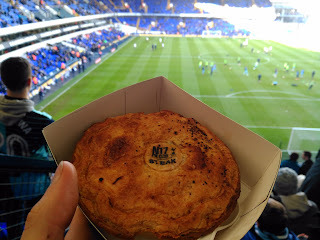 continue reading "Football Pie: Tottenham Hotpies"
Billy's Bakehouse - Aussie Pies from The Netherlands! Darren comes from a small coastal town in Australia but has been living in the Netherlands for over 20 years. Unfortunately the Dutch are not into pies and Darren missed the pies he used to get in Australia. Like us, he found many of the frozen pies he could import from the UK were not up to scratch. His Dad was a butcher and his Mum a pie lady so with this background he thought he would try and make his own. When other people tried his pies, they quickly caught on. He soon started a business making fresh pies for pubs and doing festivals during the times of year when his building work was quieter. Given that demand was varied, fresh pies would spoil before being used so Darren started making frozen pies with the emphasis on making them quick to cook on demand. The brand Billy's Bakehouse was born, marketed as producing authentic Australian pies. He also decided to make an affordable, everyday pie rather than a premium gourmet pie. The pies are small so that they can be eaten with one hand and to open up the market to younger pie fans and women who typically would want a smaller pie. It struck me that Darren has really thought about his market, more so than most pie makers I come across. From my experience, it does feel he has identified a bit of a gap in the market. Sales are good for Darren, particularly at music festivals, but there is one problem. The Dutch have no idea about pies! A meat pie in particular is not a concept they are familiar with, so to make headway with Dutch supermarkets he has his work cut out. Hence Darren has an ambitious plan to break into the UK market somehow, be that via a franchise or importing pies. This brought him over to chat to some companies and he also decided to contact the Pierateers to get our opinion! Darren claimed to have come up with a unique way of making the frozen pastry work. He said that coming at it from a non-culinary background had allowed him to think outside the box. He didn't let me in on the secret but said it was a bit unusual. Hopefully nothing too weird though! Darren gave me detailed instructions for how to cook the pies. They must be cooked in the foil and on a baking tray. He also specified the relatively high temperature of 200°C. It felt like it was a bit of a science experiment rather than baking a pie. I was glad he gave me 21 pies so I could make sure I got some right! It also allowed me to share some with Pierateer Rob. (I meant to give him meat pies and chicken pies but turns out they were all meat, oops.) Whilst I tried to follow the instructions, perhaps there was some variability to the oven because some cooked better than others. Some had perhaps been slightly defrosted in their travels which meant they weren't quite at their best. When they did cook right though, the pastry was very good, especially given that it was frozen. It was slightly flaky but with a bit of crunch. There was a nice buttery taste to the pastry. As Pierateer Rob observed, it was nice that the sides and base cooked well too, there were no soggy bottoms here! It is actually quite unusual to achieve this for a frozen pie. This meant the pies held together well making them ideal to eat by hand. I can see they would work well as a festival pie. The pies retail for €2.79 for a box of 2 in supermarkets, putting them just above £1 each at post-referendum rates. This is competitive with other companies such as Birdseye which dominate the frozen brands in this country. At festivals the offers vary but they tend to be around €3.20 each. This is cheap compared to pies at event we go to (like the football where prices tend to be #PieHighPrices). But onto the fillings! I was given four different flavours, meat, spicy meat, chicken and veggie. The meat was minced beef which is the traditional Aussie style. Darren said this is the pie he would always try first to see if a pie maker is worth their crust. 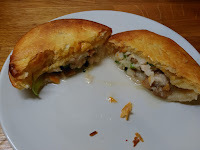 Whilst we do tend to prefer bigger meat chunks on the Pierate Ship this has allowed Darren to make these pies both good quality and affordable. Whilst it was minced meat, it was still in relatively big pieces. This indicated the quality of the meat was better than most minced meat pies where the meat is ground so fine there is nothing at all to chew. The flavour was fairly simple, meaty with little seasoning, but not too much. 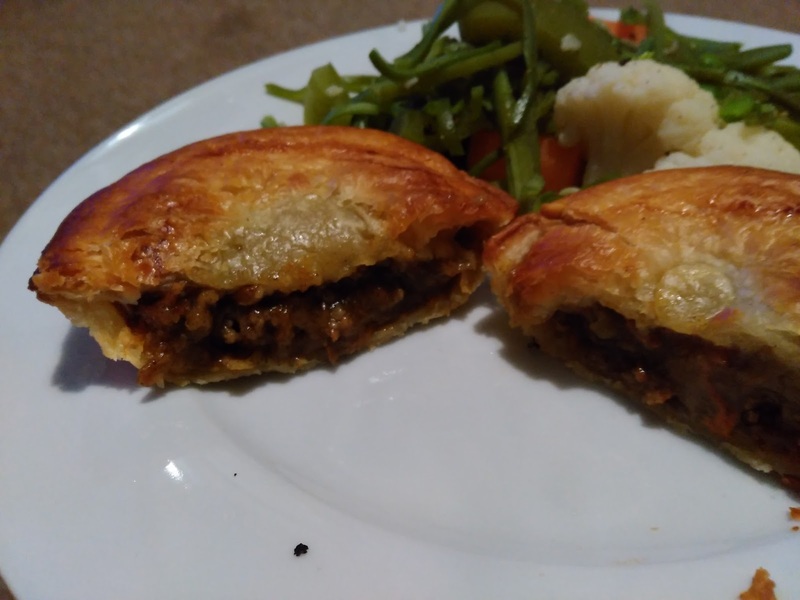 The seasoning was different (in a good way) to the average meat pie in the UK, but my palette is not refined enough to determine what the differences were. I was, as advertised, a classic Aussie meat pie at an affordable price! The same type of meat as the standard meat pie but this one packed more of a punch. To me, it tasted like someone had injected a meat pie with chip shop curry sauce and then added a bit more pepper and chili to make sure it was hot enough. Again, it didn't do anything fancy, it was simple but effective. I couldn't choose between this and the meat pie as my favourite, it depends on how you feel on the day. The flavour of this pie was so much nicer than your average chicken and mushroom pie in this price range. It was a world away from the horrible grey gloop that you often find. There was plenty of leek which added of flavour with a good amount of salt. The mushroom added nicely to the texture and variety of the pie without over powering the flavours. It seemed like a different variety of mushroom to what we typically eat in the UK. The chicken was in quite small pieces but just about big enough to get your teeth into. Unfortunately, the sauce was a bit too thin for me which, was surprising when the others had quite a thick sauce. Hence, it lost marks against Consistency. The leek was also a little Chewy which detracted from the texture. A shame when it did some aspects very well. Given the choice of filling, it is not too surprising that this was quite a soft pie. It had a consistency like a cheese & onion pie or a butter pie. There was again, a welcome flavour from the leek, so this pie avoided being bland. 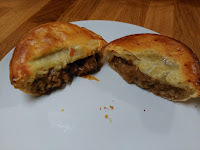 There was, of course, not much to chew, this type of pie slips down too easily to be something I would choose regularly, but it was tasty enough to eat again. Perhaps as a 'side' to one of the meat pies, it would be a bit like pie and mash then! 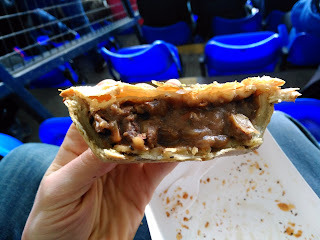 perfect pies to eat at football matches. They cook quickly, they are easy to hold in your hand and for the most part the hold together very well. For some reason in England, most football pies tend to be stodgy and gloopy affairs that make a mess everywhere. Here's hoping that a club signs this talented foreigner up! We wish Darren and Billy's Bakehouse good luck in the future. 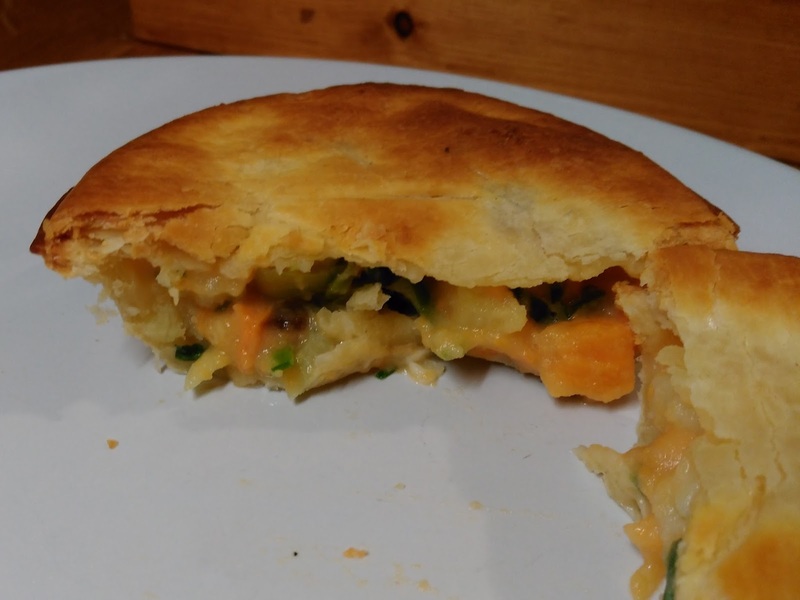 continue reading "Billy's Bakehouse - Aussie Pies from The Netherlands!"